Despite his successful career culminating in being elected twice to the Presidency, some want to claim “he’s never worked” (huh? ), or that he’s a horrible leader (though one who has managed to reshape American foreign policy, pass major legislation, and use his executive powers in a really effective manner). Now one expects the opposition to dislike the President — the left certainly skewered Bush — but the rants against Obama are over the top. They are irrational and even bizarre. Part of it is generational. To some – especially older white males (my demographic so I’m not knocking the whole group) – Obama is just, well, strange. 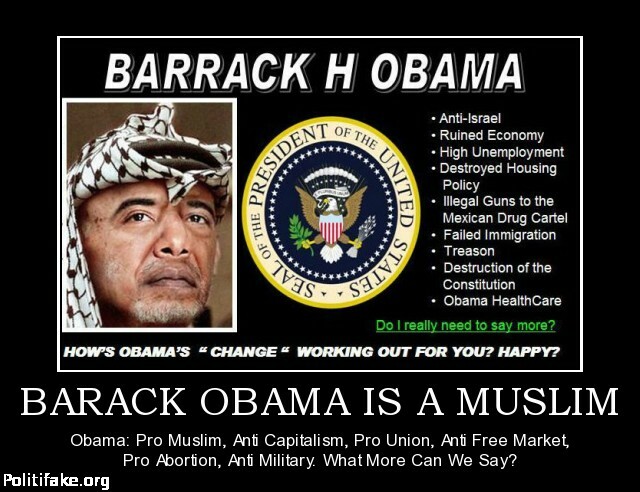 His name is Barack Hussein Obama. He was born in an interracial marriage back when those were even less accepted than gay marriage is now. His dad was from Africa, and his mom worked abroad and had a very progressive world view. Living abroad allowed him to expand his horizons at a young age. Obama has proven a very effective diplomat. 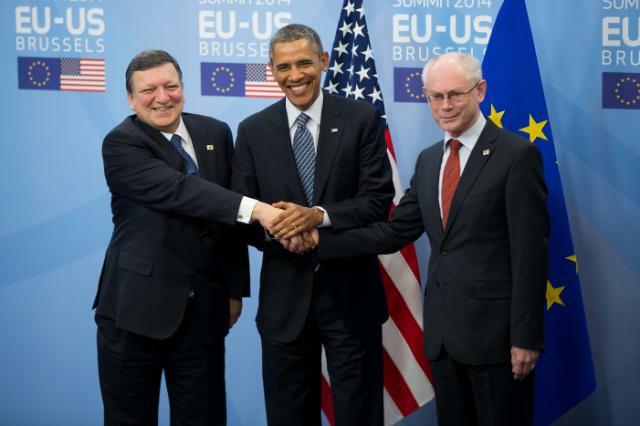 On his left is European Commission President Jose Manuel Barroso, and European Council President Herman van Rompuy. To me, that’s positive – he grew learning how to adjust to other cultures and be open minded. I think a President should understand that the US perspective is not the only one, that makes him a better diplomat on the world stage. Yet Giuliani said “he didn’t grow up the same,” meaning that to Rudy, Obama’s unique upbringing somehow makes him foreign. He isn’t like past Presidents. 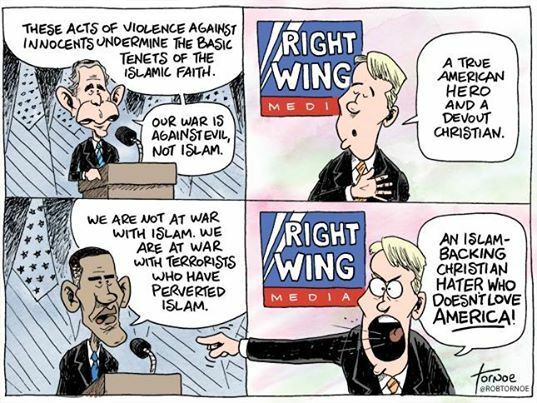 But that is wishful thinking on the part of the reactionary right. The cultural transformation has a momentum all its own and will continue no matter who is elected President. This isn’t a threat to American values – Obama believes in freedom and democracy as much as Giuliani – but a sign that the US has to adapt to a world in transition. If anything, Obama has strengthened the US image abroad. When President Bush tried to get the UN to approve his plans to invade Iraq, he was countered by an alliance of Germany, Russia and France – an unheard of audacious opposition to US policy! As the Iraq war went south, it became clear to the world that the US capacity to project military power to achieve political outcomes was weak, and the American public rebelled against the effort. Then in 2008 an economic collapse brought forth the worst crisis since the great depression. Obama inherited a country divided by war, weak on the world stage, with an economy in free fall. The economy has turned around, and record deficits have been cut dramatically. While the world remains dangerous, the US is no longer involved in the wars Obama inherited, and new US military action is done in conjunction with other regional powers. Obama understands that if the US goes in and tries to take center stage the push back will be immense, as it was in Iraq. After all, ISIS began to form in the chaos the Iraq war created. This kind of over the top bizarre attack reflects the sense by some Americans that Obama represents a strange sinister force. It would be naive not to recognize that racism explains a part of the visceral reaction. In short, President Obama is transitioning US foreign policy from being the leader of the West in the Cold War, to being able to partner with other states in a new multi-polar world with multiple threats. It’s the right strategy. On the domestic front, despite obstruction from Congress, the US is building a sustainable economy for a new era, with production finally going up. Much work still has to be done, but the US has turned the corner from the catastrophe of 2008. President Obama will be remembered as one of America’s great Presidents. He is not letting the vitriol from the right get to him. He is a leader, he knows that he has to focus on what is right rather than appease the pundits. After all, the irrational extremes of Obamaphobia would not exist if he were not effective. He would not have handily won two elections if Americans really thought him strange and different. He represents the new silent majority, people looking to the future rather than the past. The angry minority may rant and rave, but it’s a sign of their impotence in the face of a profound cultural transformation. Greek protesters in support of the Syriza party, a left wing party that dominated last month’s elections. In 2008 the global economic crisis unmasked the structural weakness of the economies of southern Europe. Greece was by far in the worst shape. 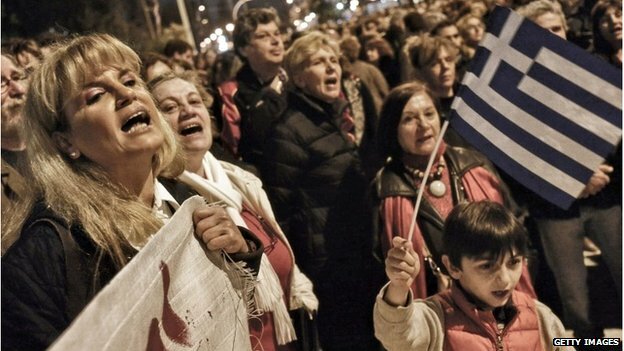 In 2010 the EU brokered a bailout deal for Greece, predicated on the country embracing a very painful austerity program. 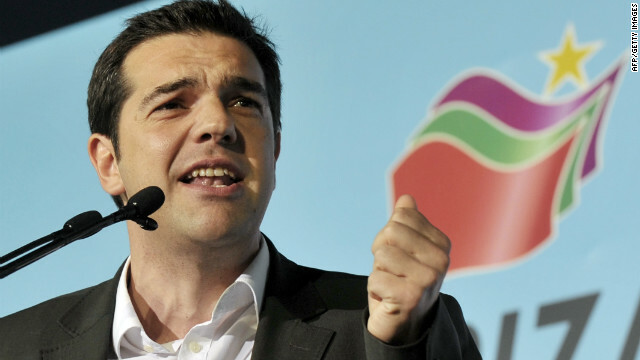 In 2012 Syriza campaigned against the cuts and urged Greeks to chart a course not dictated by the EU. Greek voters, skittish about loosening ties with Europe, said no, and Syriza won just 78 out of 300 seats. Three years of painful recession later and the Greeks have had enough – Syriza won 149 seats, just short of an absolute majority. The left wing party joined in a coalition with ANEL, a small right wing conservative party to form a government. Greece has a debt of about $500 billion, 180% of it’s GDP. 60% of that debt is owed to the Eurozone, so a default would have serious, though not disastrous implications. Very little of that debt is held by Greece. After the election Greece’s 10 year treasury bond yield skyrocketed to over 10%, meaning rising the debt would be prohibitively costly. Syriza’s leader, new Prime Minister Alexis Tsipras, vows to keep this campaign promises, all of which violate the conditions of the bailout. These include increasing the minimum wage, cutting property taxes, increasing pensions, rehiring fired public sector workers, and giving free electricity to those “suffering the most.” Since he doesn’t want more debt, the only way to do that is to print money – but Greece is in the Eurozone and monetary policy is controlled by the European Central Bank (ECB). So what next? One might wonder if Tsipras is out of touch with reality, wanting to increase spending to get out of debt. But he makes a good point that austerity simply increased the scope and depth of the recession. The ‘bailout’ benefited Eurozone banks more than the Greek people. He believes his policies would stimulate the economy so that Greece will be able to pay back its debts and show itself to be solvent. Unfortunately the Greek economy was built on sand – debt and public sector employment hid the fact the Greek economy is structurally flawed. Just ending austerity won’t change that, nor alter the dynamics that created the crisis in the first place. Last week Tsipras and his Finance Minister Yanis Varoufakis visited European leaders to try to assure them that they weren’t going to rush out of the Eurozone, and to convince them to support a bridge loan to fund the government through September. On Sunday Tsipras said that the Euro was a “fragile house of cards” and if the Greek cards were pulled it would collapse. On Wednesday Eurozone finance ministers are meeting to discuss what to do next. The Euro is not likely to disappear whatever Greece does. Tsipras is playing a game of chicken – pushing the EU to accept his policies and offer help in exchange for Greece holding on to the Euro. More importantly, if he were to leave the debt owned by Eurozone banks would become toxic, threatening a banking crisis. Still, the threat to the Euro is much smaller than it was back in 2010, or even during the election of 2012. At that point high bond yields threatened a number of countries, especially Spain and Italy. Today Italy’s bond yield is 1.76%, while Spain’s is 1.38%. Those are below the US yield of 1.94%! This suggests the fears of contagion no longer exist and Greece is being treated as an isolated case. 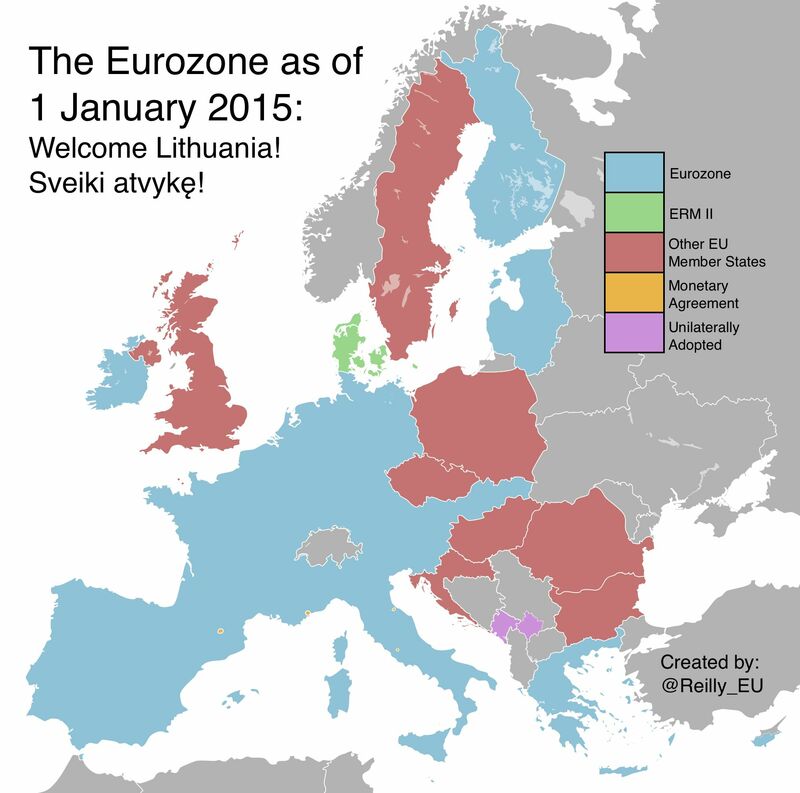 With 19 countries now using the Euro – Lithuania joined last month – it could withstand a Greek departure. But the Prime Minister does not want to leave the Eurozone, and therein lies the rub. Greeks know that leaving the Eurozone would put them on a path towards increased isolation and continual crisis. He’s betting he can arrange a bridge loan through August, and that while Greek debt is high, the Greek economy is small. The cost to the EU member states would not be prohibitive. While some European leaders are sounding cautiously optimistic about making a deal with Tsipras, German Chancellor Angela Merkel is having none of it. While not dismissing anything out of hand, she says it’s up to Greece to come up with a plan. Tsipras has said he’s working on further reforms designed to mollify EU critics, but it’s unlikely he’ll convince Merkel, who fears this will simply enable Greece to go back to its old ways. 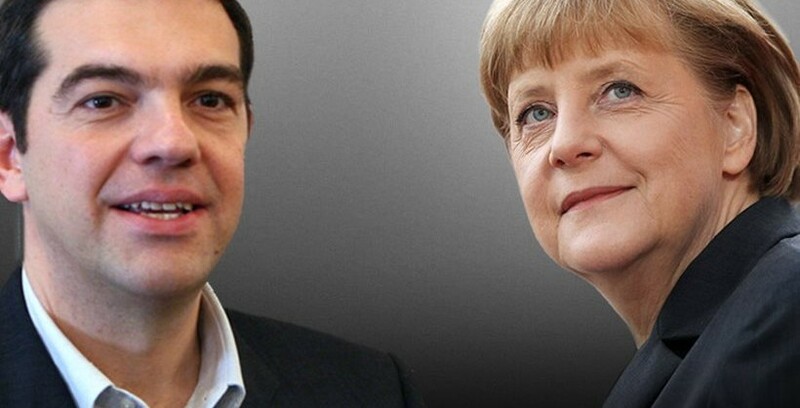 Tsipras and Merkel will meet for the first time this week. 1. Those predicting the end of the Euro will be disappointed. Countries are politically committed to monetary union as the best way to assure economic stability. Businesses and banks – the people who really run the show – are almost unanimously in favor of it. Now that Italy and Spain are no longer seen as “the next to go” if Greece leaves, the Euro is not in existential danger. 2. Tsipras and EU leaders, particularly German Chancellor Merkel and French President Hollande, will engage in tough negotiations, but are likely to reach a deal. It’s in their interest. The EU leaders do not want their banks to suffer due to the Greek debt they hold, nor do they want instability associated with the first departure from the Eurozone. Prime Minister Tsipras knows that the Greek economy would be severe crisis if he actually tried to go back to the drachma, perhaps worse than the last few years of recession. 3. The agreement might work. Merkel needs to be firm on the need of Greece not just to stimulate their economy, but to restructure it. Greece needs to develop a productive and sustainable economy. They do not have one now. Tsipras has to recognize that reality.. The telling point is that nobody involved wants Greece to leave the Eurozone. It is in their interest to maintain it, even strengthen it. It is in the EU’s interest to have Greece develop a sustainable, productive economy. The bailout and austerity program didn’t work – even though the Greek voters gave it a chance back in 2012. With some creative thinking, it may be that contrary to expectations, the victory of Syriza may end up being good for the EU.